In pharmacoepidemiology, routinely collected data from electronic health records (including primary care databases, registries, and administrative healthcare claims) are a resource for research evaluating the real world effectiveness and safety of medicines. Currently available guidelines for the reporting of research using non-randomised, routinely collected data—specifically the REporting of studies Conducted using Observational Routinely collected health Data (RECORD) and the Strengthening the Reporting of OBservational studies in Epidemiology (STROBE) statements—do not capture the complexity of pharmacoepidemiological research. We have therefore extended the RECORD statement to include reporting guidelines specific to pharmacoepidemiological research (RECORD-PE). This article includes the RECORD-PE checklist (also available on www.record-statement.org) and explains each checklist item with examples of good reporting. We anticipate that increasing use of the RECORD-PE guidelines by researchers and endorsement and adherence by journal editors will improve the standards of reporting of pharmacoepidemiological research undertaken using routinely collected data. This improved transparency will benefit the research community, patient care, and ultimately improve public health. The RECORD (REporting of studies Conducted using Observational Routinely collected Data) guideline represents the current best practice standard for the reporting of research using non-randomised routinely collected health data. The guideline was the product of an international collaboration focused on improving the reporting of observational studies using routinely collected data.117 RECORD consists of a checklist of 13 items that supplement or modify the earlier best practice guideline, STROBE (STrengthening the Reporting of OBservational studies in Epidemiology), which focused on the reporting of observational studies.118 The RECORD statement was informed by a systematic review that highlighted major deficiencies in the reporting of studies using routinely collected health data.11 Since its publication, RECORD has been endorsed by more than 20 major journals (for more information, see www.record-statement.org). However, the methodological complexity of pharmacoepidemiological research means that certain reporting requirements are beyond the scope of either RECORD or STROBE. Here, we aimed to extend the RECORD statement to include reporting guidelines specific to pharmacoepidemiological research—that is, the reporting of research focusing on the uses and effects of drugs.19 This initiative is complementary to existing guidance in the field that mainly focuses on methods for doing (instead of reporting) pharmacoepidemiological research and evaluating the quality of published papers.2021 We welcome global community engagement in this endeavour and comments from interested parties by email as these guidelines will be updated periodically. We convened a group of international experts in pharmacoepidemiology, routinely collected health data research, reporting guidelines, journalology (that is, the science of publication practices), the joint International Society for Pharmacoepidemiology/International Society for Pharmacoeconomics and Outcomes Research consensus paper on reporting requirements to make database studies reproducible,22 and knowledge users to adapt RECORD for non-interventional pharmacoepidemiological research (RECORD-PE), as presented below. Draft items to be considered in a RECORD-PE checklist were proposed by authors and considered during regular teleconferences and electronic communication, resulting in a draft checklist. A face-to-face meeting was then held in Montreal, Canada, on 25 August 2017. At this meeting, attendees voted on the inclusion of proposed statements and the appropriate wording of these statements, using the approach previously described for the creation of the RECORD statement.17 Items were included in the checklist if more than 80% of participants agreed on the concept, wording, and message of the item. The draft manuscript and checklist were subsequently revised and circulated to all authors and the RECORD steering committee for comment and approval. It was also circulated to the members of the International Society for Pharmacoepidemiology for comment after completion of the draft and revised accordingly. Table 1 shows the complete RECORD-PE checklist, which is organised according to standard manuscript sections and follows the conventions set out in STROBE (and subsequently RECORD).118 The checklist consists of 15 additional items, of which 13 focus on the methods section. Because this checklist is an extension of RECORD, which in turn is an extension of available STROBE items, the statements specific to pharmacoepidemiology are presented next to corresponding STROBE and RECORD checklist items. STROBE additionally has specific checklists for study designs including cohort, cross sectional, and case-control studies. For RECORD and RECORD-PE, we have extended the general STROBE checklist.1018 Authors will be expected to consider each checklist item when drafting their manuscript and include items in their manuscript submissions. Below, we provide explanatory text for each RECORD-PE checklist item, organised by manuscript section, and provide a glossary in supplementary table 1. For content sufficiently covered under STROBE or RECORD, no additional items are provided, although explanatory text regarding particular aspects that might be more pertinent to pharmacoepidemiological studies is provided. All relevant explanations are presented under the respective RECORD-PE item or article section. The RECORD-PE statement is intended for use only in reporting on pharmacoepidemiology studies conducted with routinely collected health data, and represents a minimum standard of reporting for such research in published papers. Such studies include investigation of the use, effectiveness, and safety of drugs or drug eluting devices (eg, drug eluting stents) used in clinical practice. In addition to the widely accepted uses of routinely collected health data for pharmacoepidemiology, in recent years, the concept has emerged that cohort studies of interventions using such data could also be considered attempts to emulate a target trial of the intervention of interest. This concept has been considered helpful within epidemiology and pharmacoepidemiology.2324 Routinely collected health data can also help studies with baseline randomisation or pragmatic trials, because the data are frequently collected as part of routine care or health system administration; however, guidance for the reporting of pragmatic trials or trials using these data is beyond the scope of RECORD-PE. No items specific to the RECORD-PE guidelines are needed in addition to the STROBE and RECORD items for the introduction section. The STROBE guidelines advise authors to detail “specific objectives, including any prespecified hypotheses.”18 The RECORD explanatory paper further recommends that authors be explicit about whether analyses were exploratory or confirmatory, post hoc or prespecified, or a mixture of these characteristics. Authors should highlight how interested readers can access the study protocol. These recommendations are needed to enable stakeholders to interpret pharmacoepidemiological studies. Include details of the specific study design (and its features) and report the use of multiple designs if used. STROBE recommends that researchers present key elements of the study design early in the paper.18 Because routinely collected health data are typically collected in advance of undertaking a study, researchers can theoretically use a range of study designs (eg, self controlled case-series, cohort or case-control studies) or design features (eg, new user designs) depending on the research question. Use of a range of study designs within papers was not directly considered by RECORD. Two aspects of pharmacoepidemiological research warrant an extension to the STROBE statement. Firstly, researchers in the field often use specific study design features (eg, the active comparator new user design) not covered by existing STROBE guidance. Secondly, it is common to use more than one such design or design feature in one publication. Readers should be able to determine which study designs or design features were used. This information will facilitate those readers interested in replicating the methods used. Study authors should describe such study designs or design features with as much detail as is necessary to make clear to readers what the design involved. If using multiple study designs or design features, authors should comment on which was used for the primary analysis. Authors also should comment on and justify deviations from any study protocol or explicitly state that there was no changes from the protocol. The use of a diagram(s) is recommended to illustrate key aspects of the study design(s), including exposure, washout, lag and observation periods, and covariate definitions as relevant. We recommend the inclusion of a diagram or figure that illustrates the overall study design or timeline for patient inclusion (including key study aspects such as prescription start and end, risk periods, exposed periods, unexposed periods, grace periods, induction periods, and washout periods). Exposure periods are complex in pharmacoepidemiology and are often difficult for readers to follow; this item was not specifically recommended by RECORD. If more than one type of design or analysis is included in the study, a diagram for each is recommended. This allows potentially complex analysis designs, including multiple at-risk periods between or within patients, to be visually summarised in a way that can prevent misinterpretation of paragraphs of text describing the design and implementation. Illustration of exposure assessment periods in self controlled case series studies—a paper by Douglas and colleagues29 relates to the use of orlistat and risk of acute liver injury and contains a figure describing a typical timeline for a patient in the study (fig 1). The study used a self controlled case series design, and the diagram provides an example of the distribution of unexposed and exposed periods for one patient (baseline, pretreatment, and multiple time periods of orlistat exposure) and highlights the liver injury risk periods. 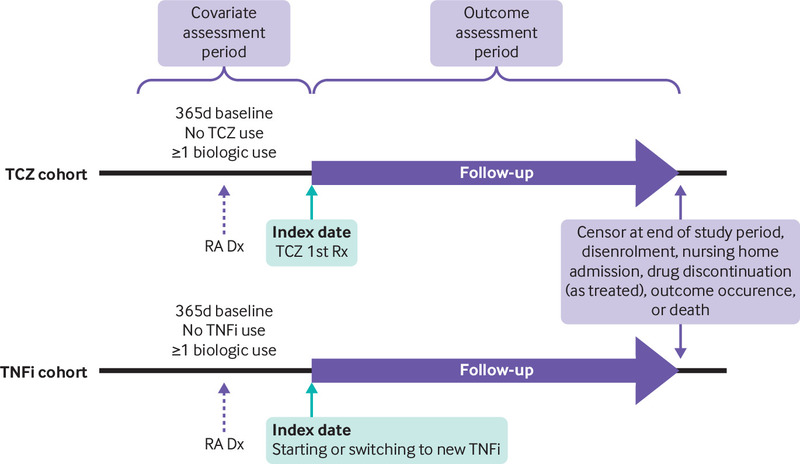 Illustration of exposure assessment periods in cohort studies—this study by Kim and colleagues30 on tolciluzimab use and the risk for cardiovascular events describes an active comparator new user comparing two biological medicines to treat rheumatoid arthritis (fig 2). The figure shows two key inclusion criteria (use of ≥1 biological medicine and a diagnosis of rheumatoid arthritis without prior exposure to the specific drug), and the follow-up periods for the two exposure groups, including washout windows. Time periods are clearly marked and censoring events described. No additional RECORD-PE items are needed to broaden the existing STROBE items. As discussed in the RECORD explanatory document, readers need to understand both the reasons and context of data collection to be able assess the potential for information bias, for example, were the data collected for clinical care or billing purposes. Readers also should be able to determine whether the population in the database represents the source population in order to evaluate the generalisability of findings. Describe the study entry criteria and the order in which these criteria were applied to identify the study population. Specify whether only users with a specific indication were included and whether patients were allowed to enter the study population once or if multiple entries were permitted. See below for guidance related to matched designs. When patients are included in a study on the basis of their exposure status to one (or more) drugs, there are likely to be several ways of defining the entry criteria; hence an extension to RECORD is required. We refer here to three levels of population hierarchy described in detail in the RECORD explanatory text—namely, the source population, database population, and study population. In many Scandinavian databases, the source population and database population might represent the same individuals because they comprise the entire population of the specific country.1 The database population is derived from the study population and contains people who meet eligibility criteria (eg, in the case of primary care databases, they are in primary care practices and have not opted out of inclusion in the database). It is important to provide details of the inclusion and exclusion criteria applied to identify the study population, which includes clearly specification of how exposure status and other eligibility criteria are defined. Authors should also be clear whether the exclusion criteria are applied before or after selection of study entry dates. Reporting these details would greatly enhance study reproducibility and ability to evaluate the relevance and validity of findings. A detailed description of matching procedures should be provided. For control sampling, the time axis on which the risk set or incidence density sampling was conducted should also be reported. The procedure for handling cases without eligible controls should be explained (eg, loosening of matching criteria, exclusion). A description should further include whether frequency or individual matching was used, whether matching was done with or without replacement, and the algorithm used (eg, greedy v nearest neighbour matching). Describe how the drug exposure definition was developed. Authors should specify clearly how drug exposure code lists were obtained. This information could include which dictionary was searched (eg, the Anatomical Therapeutic Chemical (ATC) classification, or database or country specific codes such as the National Drug Codes in the US)33 and how these dictionaries or data sources were searched (eg, automated or manual), as well as which drug substance name(s) and what route of administration was used for the search and which ATC classification level was applied. This level of detail allows readers to interpret the completeness and veracity of the exposure definition and permits replication of study findings, and goes beyond the detail of RECORD. Specify the data sources from which drug exposure information for individuals was obtained. Authors should make clear what the data source is and whether the electronic records represent issued prescriptions from electronic health records or redeemed prescriptions. Readers also need to understand whether a database contains information on reimbursed prescriptions, out-of-network dispensations, drugs directly dispensed by healthcare providers (samples), or over-the-counter drug use and the completeness of these variables. Describe the time window(s) during which an individual is considered exposed to the drug(s). The rationale for selecting a particular time window should be provided. The extent of potential left truncation or left censoring should be specified. To account for variation in refill behaviour, refills that are sufficiently close together usually are considered to represent continuous use. A drug is often considered discontinued, in the absence of a new refill, if a prespecified time interval goes past the assumed expiration date supplied in a given prescription (based on the estimated number of days prescribed). This issue could be important in systems such as electronic health records, which have variable coding dates. Readers may want to consult recently published recommendations on how to compute such durations of exposure and how to report methodology.37 The definition of the exposed period also can be used to assess the outcome of discontinuation. Because prescription or redemption records are an imperfect measure of true drug intake, the algorithms and assumptions used by authors to define exposed time should be reported. Different definitions of the exposed period can be examined by researchers in sensitivity analyses, which should be reported in the manuscript or appendices. In routinely collected health data, issues of left or right truncation and censoring might also affect the definition of drug exposure and outcome data, and might result in important misclassification and bias—hence, these issues should be reported in publications of routinely collected health data.38 For example, right truncation could exist in an electronic health records setting because patients transfer between practices or within administrative systems if they become ineligible for insurance coverage; decisions around these aspects should be made clear to the reader. Justify how events are attributed to current, prior, ever, or cumulative drug exposure. In pharmacoepidemiological studies, it is common to compare rates of adverse events between two drug groups or two or more periods. The adverse event rate is defined as the number of adverse events divided by the total time at risk for a given exposure. It is important to consider and report transparently how the time at risk is defined. The definition of time at risk depends on the pharmacokinetic properties of the drug, the nature of the endpoint of interest, patient related factors, and the plausible hypothesis about the induction period linking the drug and the endpoint. Outcomes can be attributed to drug exposure anywhere along the spectrum from “currently exposed” to “ever exposed” when a binary exposure variable is considered. Another risk attribution model within this spectrum is “on drug plus a lag window.” In this model, an event can be attributed to treatment for a given time period beyond drug discontinuation, thereby allowing time for the drug to continue having a residual effect within the body, or for delayed presentation of the outcome. Different risk attribution models can lead to different conclusions based on the same data. This issue has led to guidelines for rheumatology biological medicine registers, suggesting that research groups use similar risk attribution models when addressing the same research question, to increase comparability of findings.41 When defining the risk attribution model, researchers may also consider the possibility of protopathic bias, for example, starting a drug to treat early symptoms of the undiagnosed outcome.42 If protopathic bias is possible, authors should describe it in their manuscript. When examining drug dose and risk attribution, describe how current treatment, historical treatment, or time on treatment are considered. Use of any comparator groups should be outlined and justified. Confounding by indication has also been called an “intractable” bias in epidemiology,49 because the choice of treatment is guided foremost by the risk of a particular outcome; hence this item has particular relevance to pharmacoepidemiology. This bias might lead to strong confounding, perhaps greater than that arising from associations due to underlying common causes. Moreover, the degree of confounding by indication is difficult to assess, because it is based on an expected prognosis, and that expectation is formed in the mind of an individual health professional dealing with an individual patient. An appropriate choice of a comparator treatment is key to reducing confounding by indication or severity (see RECORD-PE item 4.a). If there is no comparator group or cohort, authors should state why. Clear description of the use and justification of comparator groups is needed for the assessment of the potential for confounding by indication or severity. Comparators might include alternative drug exposures for the same indication, differing time windows for the same drug exposures, use of historical comparators, unexposed periods, or unexposed individuals. In the absence of randomisation, confounding (by indication) deserves close attention. Therefore, researchers can use more than one comparison group and make inferences based on whether the estimate of association changes in response to better control of confounding (eg, whether an odds ratio based on an active comparator differs with or without adjustment for confounders), and these analyses should be reported in the published paper. Historical active comparator groups can be assembled from routinely collected health data for single arm studies or when a contemporaneous active comparator is not available; any of these approaches should be clearly reported. Outline the approach used to handle individuals with more than one relevant drug exposure during the study period. In a cohort study comparing the incidence of an adverse reaction between two or more drug exposures, the method of handling individuals who receive multiple drugs at the start of their exposure period (or drug 1 initially, followed by drug 2) should be described to enable readers to interpret findings (see also RECORD-PE items 7.1.d and 7.1.e). Some studies exclude patients who, according to the prescription or dispensing record, receive more than one treatment at the same time at cohort entry, since attribution of risk is difficult. Censoring is used most often if more than one treatment is experienced during follow-up (see below). Alternatively, exposure to more than one treatment (eg, while switching from an old treatment to a novel treatment) can be handled through time varying exposure, whereby each patient’s person time is segmented, based on the dispensing record, with appropriate methods for handling time dependent confounding (eg, marginal structural models, g estimation). The approach taken by authors should be reported transparently, including defining risk attribution models and lag periods. Describe the healthcare system and mechanisms for generating the drug exposure records. Specify the care setting in which the drug(s) of interest was prescribed. The type of healthcare system, the characteristics of patients for whom drug data are available, and the extent to which patients are reimbursed for prescription drugs could affect the likelihood of drug use, and the likelihood of a record of drug use being included in the study data—for example, formulary restrictions could preclude the use of drugs. Understanding this context will be important for interpretation of generalisability or understanding the limitations in availability of drugs in different settings. For example, although Canada has a government funded, universal healthcare system, some provinces reimburse all prescription drug costs, whereas other provinces only cover drug costs in specific age groups or in people with low incomes who are receiving social assistance. In this second group of provinces, supplemental private insurance might be common among non-covered groups, and therefore drug records could be incomplete in provincial health administrative data. This missing information could result in partial ascertainment, because complete prescription records are available only for certain patients. Left truncation also could create bias if public insurance coverage is available only for older patients. Therefore, characteristics of the health system and context of drug data collection should be provided. No items specific to the RECORD-PE guidelines are needed in addition to the RECORD and STROBE items. Biased studies are characterised by systematic error in observed associations, and readers need to understand the approaches taken to manage bias in order for them to judge whether the results are biased. Several potential biases are likely to arise within pharmacoepidemiological studies, and could be more prominent when routinely collected data are used. Recent papers describing use of triangulation could be helpful in discussions about bias.54 The ROBINS-I (risk of bias in non-randomised studies of interventions) tool might also help to focus discussions of bias.55 We list below some potential sources of bias in pharmacoepidemiological studies that should be reported. Confounding in pharmacoepidemiological analyses might be addressed by design or analytical approaches.56 Examples of designs or design features include the use of self controlled case series, instrumental variables, regression discontinuity design, and active comparators. Examples of analytical approaches include the use of multivariable regression analysis or propensity scores, although these approaches will not guarantee absence of confounding. The study design or analytical approach used to address confounding should be reported, and the authors should note in the discussion the extent to which these methods potentially addressed or failed to address the risk of confounding. If more than one method was used, authors should make clear which approach was the main analysis and which were sensitivity analyses. Of particular relevance when considering confounding in studies of drug treatment is the type of treatment effect that the non-interventional study is attempting to measure. Types include the intention-to-treat effect (the comparative effect of being assigned to treatment strategies at baseline carried forward, regardless of whether study individuals adhere to the specific treatment) and the as-treated effect (the comparative effect of a drug while it is actually used). In cases in which observational studies based on routinely collected data are designed to emulate a hypothetical or real trial, authors should clearly specify any relevant existing or hypothetical trial that is being emulated. For studies that allow individuals to switch drug treatments as part of the analysis, the role of potential time varying confounders should be considered and reported in the text, along with details of any complex statistical methods applied (such as inverse probability weighting of marginal structural models). For example, in their study of the effect of aspirin on cardiovascular mortality,62 Cook and colleagues include a directed acyclical graph of the hypothetical relation between aspirin use, cardiovascular death, and intervening cardiovascular events to show the role of non-fatal cardiovascular events as potential time varying confounders or intermediate steps in the association between aspirin use and cardiovascular mortality. Confounding by health status (healthy initiator bias or depletion of susceptibles) can be dealt with at the design stage by aligning the start of observation with treatment initiation (the active comparator new user design; see RECORD-PE item 4.a). The reasoning behind the decision to use such a design feature as well as the extent to which selection bias was or was not addressed should be discussed. Information and selection bias due to potential misclassification of drug exposure by prescription or redemption records can be dealt with in a sensitivity analysis that includes different definitions of exposures (eg, when different algorithms are used to define duration of prescribing episodes63). An alternative approach is to include only people with more than one prescription or redemption over a given period (eg, within six months), because those individuals with just one prescription or redemption might never have used the treatment. Use of different washout periods to define new episodes of treatment could also affect the interpretation of data. Each issue should be clearly described and discussed in reports of pharmacoepidemiological studies based on routinely collected health data. Describe the methods used to evaluate whether the assumptions have been met. In reporting all study designs, authors should discuss whether the underlying study assumptions have been met. A failure of the assumptions being met could undermine the methods used. Determining whether the methods used were appropriate, given the data, is important for readers to understand whether the resulting analysis requires further consideration. A pharmacoepidemiological example is the use of self controlled studies, in which participants act as their own controls, and include the case crossover design and self controlled case series studies.64 When applying the self controlled case series method, several assumptions must be met to obtain valid and unbiased estimates,65 for instance, exposure to the drug of interest must not be influenced by a previous outcome event.6667 Authors should specify clearly how the assumptions of self controlled or other study designs were evaluated. Detailed guidance on the conduct and reporting of self controlled case series are beyond the scope of these guidelines, but are currently being developed by the SCOPE (self controlled crossover observational pharmacoepidemiology) initiative.68 All reports should explain any assumptions that were not evaluated or not met. Discussions should also address the possibility of time related bias (eg, immortal time bias),69 if these are likely to be a problem. Describe and justify the use of multiple designs, design features, or analytical approaches. As discussed in RECORD-PE item 4.a, the use of multiple designs or design features in the same report is a commonly used strategy in pharmacoepidemiological studies to assess the potential for bias and residual confounding. If authors have used multiple approaches to analysis, these should be clearly outlined for readers to assess strengths and limitations. The authors also should state clearly how they approached reproducibility across different databases, including issues such as variability in coding and healthcare systems. If authors used a common data model71 (see the second example72 below) to analyse data across different data sources, they should describe this and specify which common data model they used. If any data pooling across data sources was done, the approaches used should be described. No items specific to the RECORD-PE guidelines are needed in addition to the RECORD items. RECORD states that “authors should provide information on the data cleaning methods used in the study.”1 This information is particularly important for pharmacoepidemiological studies, because the preparation of drug exposure data is complex and reflects serial assumptions that are typically not disclosed. Therefore, data cleaning extends substantially beyond the removal of outlying values. When data require preparation for analysis (eg, conversion of raw prescription data to exposed and unexposed episodes of person time), authors should be transparent about the steps undertaken in cleaning the data. These steps might include decisions on deriving start and stop dates; and assumptions made when instructions on administration instructions provide for flexibility (eg, prescriptions as needed), when prescriptions are overlapping, and when clinically implausible values are encountered. For the results section, no items specific to RECORD-PE are needed in addition to the earlier STROBE and RECORD recommendations. STROBE guidelines recommend that researchers report the number of individuals included at each stage of the study, including reasons for exclusion.18 The RECORD guidelines further underscore the importance of reporting how results were filtered based on data quality, availability, and linkage.1 Use of a flow diagram to illustrate the selection of the study population is encouraged by both STROBE and RECORD—note that this diagram is distinct from the study design diagram discussed in RECORD-PE item 4.b. A high level of transparency is equally important in pharmacoepidemiological studies in which additional eligibility criteria are often used (eg, based on indications for use, washout periods, and lag periods), adding further complexity to the selection process. Researchers should report the number of participants included at all stages of the study, including the analysis stage and for analyses performed to assess different objectives (eg, subgroup and sensitivity analyses). Pharmacoepidemiological studies that examine adverse drug events or reactions should report whether and how researchers assessed or validated the outcome on the individual case level (eg, through record review by a specialist blinded to the exposure(s) under study, in order to try and rule out other more likely causes of the event). This process should be clear from the text, a table, or a flowchart describing how many events were considered to be caused by the study drug(s) after record review. Presenting numbers of potential cases that lacked sufficient data to be classified as non-cases or definite cases (and were assigned a final status such as possible or uncertain) is also encouraged. In an article by Kaye and colleagues on the risk of liver injury associated with use of oral antimicrobials, figure 1 provides a good example.73 Clear delineation of the selection process facilitates critical appraisal, applicability, and reproducibility of the study findings. Regarding results from descriptive analyses, STROBE recommends that authors present detailed data on the distribution of demographic, clinical, and social variables, including the number of participants with missing data. Missing data are frequently encountered in pharmacoepidemiological studies based on routinely collected data. In studies using routinely collected data, we might not know whether there is non-recorded or unmeasured information on diagnoses, symptoms, and management. Cohort studies also should provide summary measures of follow-up time. For studies based on routinely collected data, RECORD does not include additional items.1 However, in terms of clinical variables, pharmacoepidemiological studies should report the distribution of indications for the drug of interest. It is also advised that authors summarise person time on and off drug exposure, including the sensitivity of “at risk” periods to different definitions of risk attribution if appropriate. Furthermore, in the case of time varying variables, which are increasingly used in pharmacoepidemiology, authors should consider reporting the number and characteristics of individuals with time varying data. RECORD-PE supports the STROBE recommendations for presentation of outcome data, main results, and other analyses.18 Thus, researchers should report the number of events or summary measures of outcomes (or exposures in case-control studies), unadjusted and adjusted estimates and their precision, confounder variables adjusted for, category boundaries when continuous variables are categorised, absolute measures of risk for a meaningful time period (if relevant), and other analyses performed (including subgroup, interaction, and sensitivity analyses). Authors should present the results determined using the different approaches, which could include conventional methods and more complex approaches. If multiple approaches have been used in an attempt to account for confounding (eg, matching and adjustment), the results of all methods should be presented and any differences discussed. It is advisable to present descriptive results showing covariate distribution (number and percentages) in exposure groups before propensity score matching, as well as the distribution after propensity score matching if appropriate. Authors should explicitly state whether an analysis was prespecified or post hoc. Researchers also are advised to report in detail the results of analyses used to explore and handle missing data, which are frequently encountered in pharmacoepidemiological studies based on routinely collected data. Describe the degree to which the chosen database(s) adequately captures the drug exposure(s) of interest. Authors should report whether the drug exposure in question could be ascertained by an alternative source, if not fully captured in the database used for the study. Some of the explanation outlined in RECORD-PE item 8.a is also relevant here. An additional issue relates is whether a drug exposure of interest could have been obtained over the counter, and whether such use is captured by the data source.74 If not, authors may want to discuss the likely extent of misclassification. A similar issue is that if patients are admitted to hospital for extended periods and the database does not capture inhospital dispensing of drug treatments, misclassification also might occur.6975 Authors should also discuss whether the database is likely to have had information on diagnoses, symptoms, and management, and discuss the implications for study findings. Discuss the potential for confounding by indication, contraindication, or disease severity or for selection bias (healthy adherer or sick stopper) as alternative explanations for the study findings when relevant. As discussed in the methods section, confounding by indication is a major issue in interpreting the findings of pharmacoepidemiological studies, beyond studies of routinely collected data in general. Particularly in the case of insurance or billing data (such as health administrative data), identification of study participants, drug exposures, confounders, and outcomes are based on coded data. Little or no information might be available to describe the indication for drug treatment, personal preferences and values of the patient and prescriber, any potential contraindications to use, or disease severity, all of which could confound the association between the drug and the outcome of interest. Even in clinical data (such as data from electronic health records), the indication or contraindication for drugs might not be recorded or might be contained in free text fields, and not accessible to investigators using these data for pharmacoepidemiological research. Important confounding variables thus might not be available for investigators or readers of the research report. Therefore, to the best of their ability, authors should report such potential confounding in the routinely collected health data and how the confounding was managed overall. We recommend the inclusion of a clear statement in the conclusions (or other discussion section) to explain whether the results could be explained by confounding by indication. Such a statement would help reduce misguided decision making and increase the trustworthiness of the evidence and its interpretation. This statement could report any post hoc analyses designed to evaluate the robustness of the finding and alternative explanations—for instance, to evaluate whether patients in different exposure groups were likely to have been prescribed the drugs for similar conditions. If moving of an individual to another practice or insurance database cannot be tracked, authors should clearly outline whether that individual’s person time is unique (that is, only considered from the new registration date) and discuss the effect of missing past exposures or events on the study findings. A histogram of people leaving for reasons other than death by year of age also might be useful, as well as the age distribution of people entering the population. Further, as per RECORD-PE item 12.1.b, authors should include explicit consideration of results from different approaches when they have used multiple designs, design features, or analytical approaches. This information is especially pertinent if such efforts yield inconsistent results and thus guidance on interpretation is needed. Schneeweiss and colleagues report: “Aprotinin rather than aminocaproic acid was used in sicker patients, and the modest reduction in the relative mortality estimates after the control of confounding by covariates is consistent with the hypothesis of confounding on the basis of indication. Multivariate analyses resulted in weaker associations between aprotinin and death than those reported in unadjusted analyses (unadjusted relative risk, 1.83; adjusted relative risk, 1.64). Matching according to propensity score permitted us to control for an additional 10 covariates in a highly selected cohort, which further reduced the relative-risk estimate. The complete and accurate reporting of research is an ethical requirement endorsed by leading declarations and recommendations internationally.7980 The RECORD-PE guidelines have been developed to meet an identified need and are designed to improve the reporting of pharmacoepidemiological studies undertaken using routinely collected data. They are an extension of the STROBE and RECORD statements and should be used in conjunction with the existing guidelines.11881 RECORD-PE represents a minimum standard of reporting and complements a recent set of comprehensive methodological and reporting items created with the aim of making pharmacoepidemiological research more reproducible.22 Better reporting is a prerequisite of replication, but replication requires much more detail. However, RECORD-PE also guides authors on the transparency of reporting and helps readers to understand strengths and potential limitations of the work. Therefore, RECORD-PE represents a minimum standard of reporting for pharmacoepidemiological studies undertaken using routinely collected health data. We consulted widely in the creation of these guidelines, including international experts in pharmacoepidemiology, journalology, editors, and policy makers. Despite wide consultation, we may have missed some key points. In addition, members of our guideline development working committee were primarily from western Europe and North America. Pharmacoepidemiology is a rapidly changing field with frequent new methodological developments, reflecting the growth of big data, the development of integrated or distributed data systems, and the innovative approaches being developed to reduce bias associated with the use of non-randomised data to assess drug effects. Increasing collaborative approaches across traditional geographical and data source boundaries are leading to new discoveries for patient benefit in pharmacovigilance and pharmacoepidemiology to overcome problems such as sample sizes insufficient to detect less common safety signals. We have included some recent developments briefly in this article, for example, the use of common data models. We recognise that these guidelines will need to be updated to encompass new developments. The RECORD-PE guidelines are an extension of the STROBE guidelines for non-interventional research, hence the focus of these guidelines is largely on non-interventional research in pharmacoepidemiology. There is much discussion in the literature about whether the term “observational” should be used as opposed to the term “non-interventional studies,” because all studies involve observation. For RECORD-PE, we have continued with the term “observational” in the title because RECORD-PE is an extension of RECORD which, in turn, is an extension of the STROBE guidance.118 We have briefly mentioned the use of pragmatic trials using routinely collected health data in the RECORD-PE guidelines; however, the increasing use of pragmatic randomised controlled trials (and particularly the development of registry based trials and trials within cohorts8283) will likely necessitate expansion of the currently available guidance with both RECORD and CONSORT as guiding documents. The RECORD-PE statement aims to extend existing STROBE and RECORD guidelines providing guidance for the reporting of pharmacoepidemiological studies using routinely collected data. It aims to enable readers to understand what was planned, what was done, and what was found in the research. This essential information is critical for users of research to optimally interpret the findings, including their strengths and limitations. Poor research reporting hampers the use of research findings and is an important component of research waste.84 We anticipate that with increasing use of the RECORD-PE guidelines by researchers and endorsement and adherence by journal editors, the reporting of pharmacoepidemiological research undertaken using routinely collected health data will improve. The improved transparency and accuracy will benefit the research community, and ultimately improve patient care. Contributors: SML and EIB conceived and designed the study, carried out the statistical analysis, had full access to all the data in the study, take responsibility for the integrity of the data and the accuracy of the data analysis, and are guarantors. All authors acquired data, analysed and interpreted data, drafted the manuscript, and critically revised the manuscript for important intellectual content. The corresponding author attests that all listed authors meet authorship criteria and that no others meeting the criteria have been omitted. Funding: We gratefully acknowledge funding from the International Society for Pharmacoepidemiology as well as comments received from its membership. SML is supported by a Wellcome Senior Clinical fellowship in Science (205039/Z/16/Z); EIB is supported by a New Investigator Award from the Canadian Institutes of Health Research, Canadian Association of Gastroenterology, and Crohn’s and Colitis Canada; EIB is also supported by the career enhancement programme of the Canadian Child Health Clinician Scientist Programme; KBF is supported by a salary support award from the Fonds de recherche du Québec—Santé (FRQS; Quebec Foundation for Health Research); HTS is supported by the Programme for Clinical Research Infrastructure (PROCRIN) Programme. Competing interests: All authors have completed the ICMJE uniform disclosure form at www.icmje.org/coi_disclosure.pdf and declare: main support from the International Society for Pharmacoepidemiology for the submitted work; no financial relationships with any organisations that might have an interest in the submitted work in the previous three years; no other relationships or activities that could appear to have influenced the submitted work.
. Epidemiologic methods for health policy.Oxford University Press, 1999.
. Canada’s strategy for patient-oriented research. Improving health outcomes through evidence-informed care.Canadian Institutes of Health Research, 2011. Enhancing the QUAlity and Transparency Of health Research (EQUATOR) Network Library 2015. www.equator-network.org/library/. Accessed March 7 2015.
. Pharmacoepidemiology.1.What is pharmacoepidemiology?Wiley, 2005: 3-16. European Network of Centres for Pharmacoepidemiology and Pharmacovigilance (ENCePP). Guide on methodological standards in pharmacoepidemiology. 2011. www.encepp.eu/standards_and_guidances/methodologicalGuide.shtml. Strengthening the Reporting of Observational Studies in Epidemiology (STROBE): explanation and elaboration. PLoS Med2007;4:e297doi:10.1371/journal.pmed.0040297. Control yourself: guidance for the application and reporting of self-controlled study designs in pharmacoepidemiology. Pharmacoepidemiol Drug Saf2017;26(suppl 2):3.
. Reporting and transparency in big data: the nexus of ethics and methodology. In: Mittelstadt BD, Floridi L, eds. The ethics of biomedical big data. Springer International Publishing, 2016:339-65doi:10.1007/978-3-319-33525-4_15.